The students numbering about twenty-two, who died on their way to an excursion, have been buried amidst tears. It has been reported that the 22 students, their driver and their teachers who died recently have been laid to rest. It will be recalled that the students and teachers lost their lives as a result of ghastly motor accident, on their way to Kano for excursion. They have since been buried according to Islamic rights. The funeral prayers took place yesterday at emir’s palace, Misau Emirate Council. 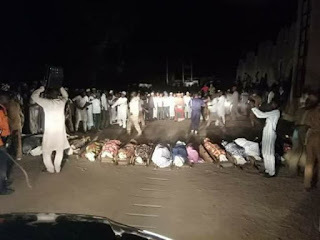 The 22 secondary school students died on Tuesday in the road accident which happened in Gaya local government area of Kano state.